A paint job is a necessity when your car starts aging and showing signs of wear. The reasons for getting a paint job to vary but the leading cause is fading. As you use your car, harsh climatic conditions cause the paint to fade giving it a dull color. This may make your car look very old. You may also be forced to repaint your car after a serious accident. The costs of a complete car paint job will vary depending on the type of paint and the size of the car. Most small car owners spend between $300 and $900, which puts the paint job at an average of $500. Higher quality paints will cost you between $1,000 to $3,500 while top dollar paint jobs expect to spend 2,400 to 7,500 dollars. 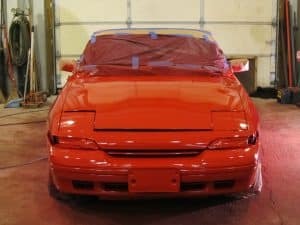 The paint job will depend on damages caused on the car; expect to spend an average of $200 for the bumper and minor scratches to the car’s body. Materials used will depend on your budget. If you are low on funds you can have a basic job paint using a single stage enamel paint. This type of paint jobs do not last and you should expect it to last for one year. A two-stage paint job will use urethane paint and this offers a three-year warranty. Above the two-stage paint job is an additional application of a urethane sealer and this should last you around 5-years. The most expensive type of paint job will begin with scratch repair with priming. All surface areas will be run through block sanding and finally, a urethane sealer is applied. Since you cannot force the paint to dry expect the actual painting of the car to take you one day with an additional day for drying. The first part is applying the primer and this should take you 10 to 15 minutes depending on the size of the car and primer used. To start the painter will apply a lighter primer for lighter colors and dark primer for darker colors. After the primer application removes the trim. You should ensure that you have covered the reflectors, windows, door handles and wipers with tape or some removable material. After application of the primer, you can sand the car at grit paper of 300- or 400 -. You can use a paint roller to apply paint to the car. In some instances, acetone and Rustoleum are mixed to have a similar thickness with water. Painters often sand the car after every coat application. The type of car that you have may cause you to sand several times. Before the application of another layer of paint wait for it to dry for 30 to 90 minutes. This will cause the paint job to take a day or two. If you have never done a paint job before then it would be prudent to remove the car parts that you do not want to have paint. This can include lights and windows. If it is proving difficult to remove the parts then the tape will get the job done. The choice of tape should be the type that is easy to remove and does not damage the car. Surface preparation is vital as it will affect the final result of the car. You should begin with sandpaper of grit of 80 to 300. The sandpaper is vital for removing any dirt and ensures you have a smooth surface. It has been noted that those who spend considerable amounts of time on the sanding have perfect paint jobs. You could be in a hurry to paint your car within the shortest time possible but this will only make the paint job look hurried. If you want a good paint job coat your car with several layers of light paint. This means that you should spray your car from a distance of 10 to 12 inches. Take your time and practice on even strokes. When spraying, do it from front to back instead of up and down. Should you miss a spot instead of going back to the surface wait for the next coat of spray. After applying each coat of paint wait for around 15 to 20 minutes before redoing the job again. This will give your paint enough time to dry. When applying the primer wait for 24 hours before starting the application of the base coat or enamel. You should also wet sand the vehicle after applying the primer with a 1,000 to 2,000 grit sandpaper. 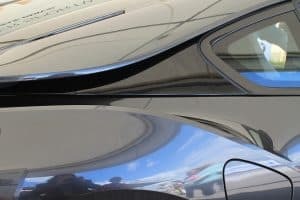 If your car has been through a collision the painter will start by straightening the dents. Straightening ensures that you have a smooth surface when applying paint. Newer cars will not require straightening. Putty is often applied on uneven surfaces after sanding. The putty dries fast and you will need to do sanding again to further smoothen the surfaces. To ensure that your car looks brand new after a paint job the painter will polish the car. This will make it look shiny. Your car with time starts looking dull due to overuse. The paint may start peeling off and that shiny look that it once had after purchase diminishes. The cost of a car paint job will vary with the paint quality that you use. Most car owners will spend an average of $500 but their higher end paint jobs that cost as high as $3,000. You will first need to prepare the car before a paint job. This will involve straightening any dents that could have come into place due to the collision. The next step is sanding of the car and applying the paint. Painting is a slow process and you should do it from left to right instead of up and down. If you are applying multiple layers of paint wait for the first coat to dry before applying another layer. A final polish is applied to give the car a shiny look. The painting exercise is intensive and should take you two days.